You know when somewhere new opens, you’re expecting amazing things, you go and eat there and you’re disappointed? The Coconut Tree opened on Cheltenham Road last week and I was pretty excited: firstly, because Bristol’s pretty short on Sri Lankan food options, and secondly, because they were runners-up in the Best Cheap Eats category in the 2017 Observer Food Monthly Awards. Their Cheltenham and Oxford restaurants have ridiculously good reviews, and I love the fact that they’re child-friendly – in fact, children under 10 eat free, with a choice of three dishes. So we booked a table for the opening weekend (50% off food too – bonus), let them know we’d need a table with space for a pushchair, and started to get excited. It was rammed when we arrived. Not really surprising, when they were offering 50% off a menu where the most expensive dish is only around the £7 mark. And it was LOUD. 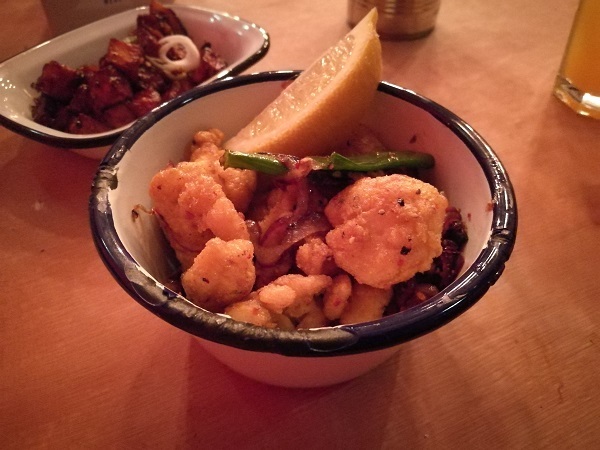 The not-so-soothing strains of No Diggity weren’t quite what we had in mind for a Sri Lankan street food place, but their RnB playlist helped the lively Saturday night atmosphere along. The design’s interesting too: the first room featuring a bar entirely covered in 2p pieces and a semi-open plan kitchen, the second with chunky wooden tables and bench style seats; higher tables with hard-backed stools, and counter seating round the edge. They’ve really crammed the seating in to give that authentic street food buzz too. There’s exposed brickwork, there’s graffiti, there’s feature wallpaper, there’s metal tins to hold cutlery at each table…pretty much every restaurant design cliché is right there. The problem? Being asked to dump the pushchair in the front room when we walked in – and this despite requesting a space for the pushchair at our table when I booked. A small amount of arguing and pointing out that our 8-month old can’t exactly sit up at a bench for the duration of the meal eventually led to some rearranging of table reservations and a convenient space to slot him in next to us. I probably got more annoyed about it than I should have done, but I’d had very little sleep the night before. Our server was very apologetic, though. On each table, you’ll find a little cocktail booklet, with The Coconut Tree’s mantra in the back. I can confirm that all of them are true – apart from point 4 (see earlier note about tiredness for why I didn’t get wasted on cocktails), and point 2…which I’ll come onto shortly. The menu’s designed for sharing – it’s all small plates, with plenty of vegetarian, vegan and gluten-free choices too. We were advised to order 3-4 dishes per person, so we went for the top end…maybe a bit ambitious when I’d already had a three-course lunch earlier that day. The only dish we didn’t share was the egg hopper (£3.50) – we had one each. It’s a bit of a Sri Lankan staple: a thin and delicate crispy coconut milk pancake, with a cooked egg (yolk still nice and runny – I approved) and three different condiments: a sweet and soft onion and cinnamon sambal that reminded me of Christmas, a shredded coconut sambal, and a Sri Lankan salsa that had a bit too much pungent onion bitterness for me. 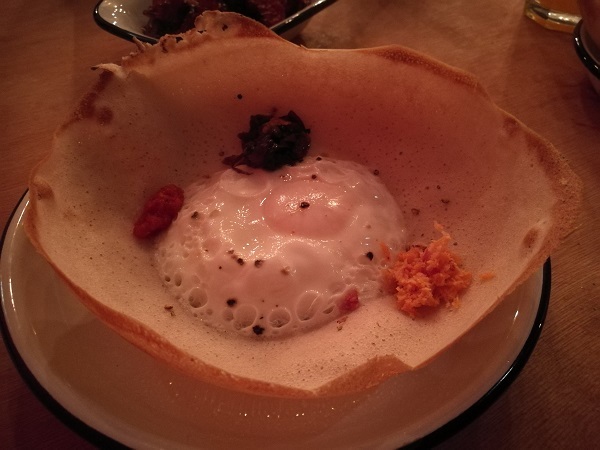 Winner of the best egg hopper in Bristol for me still goes to the Sri-licious guys, I’m afraid. Before ordering, we’d asked for recommendations, and our server raved about the hot battered spicy cuttlefish (£7). It would’ve been pretty rude not to try it after that…and we’re glad we did. Definitely the highlight of the evening, it was the first time I’d tried cuttlefish. I loved its squid-like flavour and similar texture, although it fell apart more easily. The batter was great too, nice and crunchy (I think it was maize-based…? ), and the accompanying “spicy garnish” definitely had a kick, as well as a delicious sweetness. 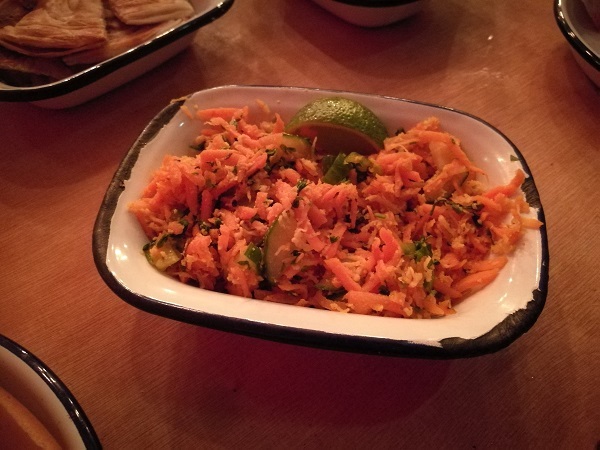 We figured we couldn’t just order fried stuff, though, so went for the Five C’s (£3.50) as our nod to healthy eating: a combination of sweet coconut, refreshing cucumber and plenty of grated carrot, with the coriander and chilli punching through at the end. Lime doesn’t begin with C, but when squeezed over, it made it even more refreshing. And then we went back to the fried stuff. 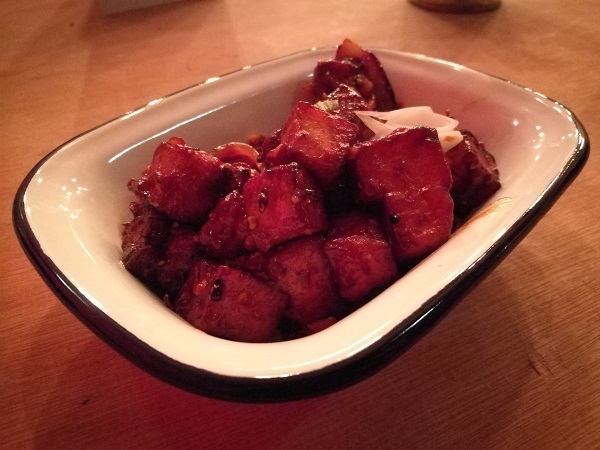 The devilled crispy pork (£7) is pretty much a Sri Lankan-style sweet and sour pork – but a hell of a lot spicier. 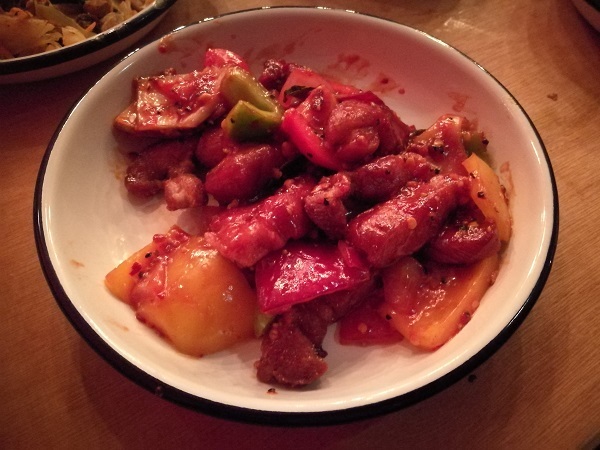 The pork was crisp on the outside but could have been a bit more tender, the massive chunks of pepper and red onion still had a nice bite…and (you’ll notice a theme here), while the chilli was pretty fiery, the sweetness was the dominant note. Equally sweet was the Cheesy Colombo (£5)…guess what, another fried dish! It’s basically paneer with a sweet and sticky coating – and it’s another spicy one too. This one was pretty good, actually – but by now, I really wanted something with more of a savoury flavour. 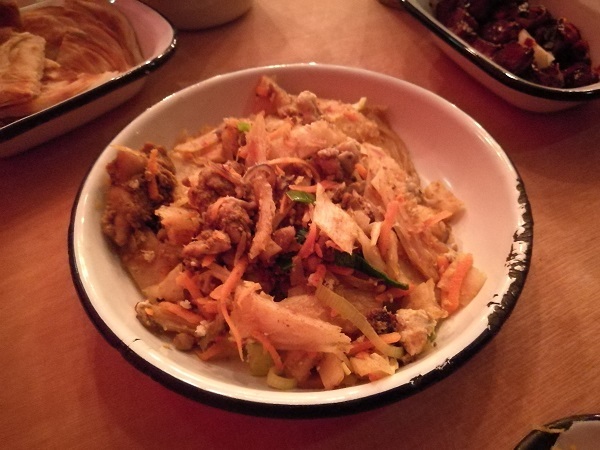 The chicken kotthu (£6) was also a recommendation – but we’d quite happily have given it a miss. 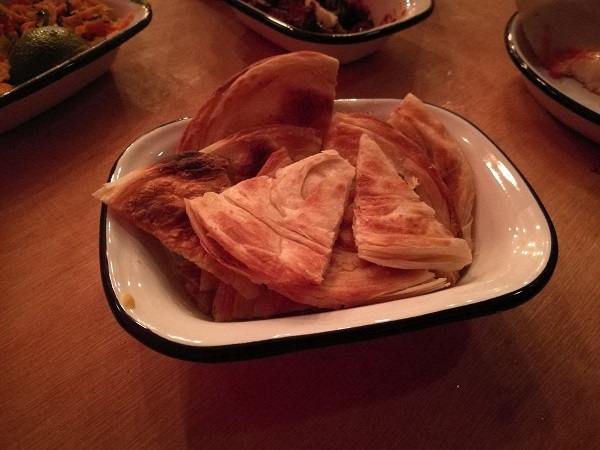 It tasted ok, but we definitely weren’t blown away – in fact, it was so mild and inoffensive that we pretty much used it as a palate cleanser between mouthfuls of the blow-your-head-off spicy dishes. Carrot, spring onion and strips of very doughy bread had been cooked up with chunks of dark chicken meat, which was surprisingly bland – and which featured the unexpected “bonus” of a big shard of bone. And finally, a serving of the parota rotti (£2.50) – a Sri Lankan flat bread that was upsold to us by our server. We actually quite enjoyed it: crispy on the outside with a satisfying crunch, layered in the middle, it held together well for scooping up the other dishes, and wasn’t excessively oily. I’d happily eat that cuttlefish again and again – it was fantastic. But the rest? Well, we just felt everything was a bit cloyingly sweet – apart from the kotthu, which was just bland – and didn’t particularly wow us. And for a venue that happily advertises its “kids under 10 eat free” offer, there was no sign of any highchairs, let alone our issues with bringing the buggy in. 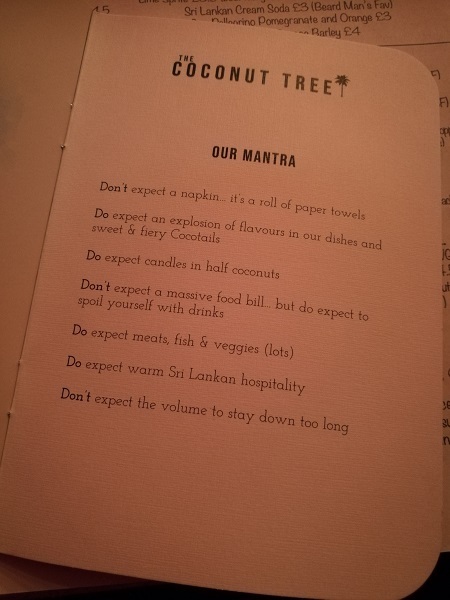 I’m glad we tried The Coconut Tree – it’s our first experience of Sri Lankan food in a sit-down restaurant. But in all honesty, I doubt we’ll be going back.